Every year the same thing happens. As the days get shorter, I go through a 2-3 week funk that I can't seem to shake. Dark at 6:30 p.m. & the shortest day is still 5 weeks away. I can't make myself get out of bed in the morning. I can barely keep my eyes open past 9 p.m. That's not me. I'm the person who is up at 5 a.m. every morning after going to bed at 11 p.m. I become a hermit (OK, a bigger hermit than normal). I just want to be at home by myself (mainly so I can go to bed by 7:30 p.m.). That's not me. I love grabbing a drink after work with friends, going over to my sisters' homes in the evening and playing with my nieces/nephews or stopping in and saying hi to my parents. I feel overwhelmed by what's happening at work. I can't concentrate without shutting my door and turning up my music. I get to work later and go home earlier because I'm so tired. That's not me. I'm usually good for 10+ hours at work and then another hour or two on my laptop at home. I'm sure all of this has to do with the seasons changing and the time change but it's so hard because I'm just not me. I can't imagine if I had to take care of others (children, spouse, pets, plants) right now. I can barely take care of myself. But I see the light at the end of the tunnel. After a mini-breakdown on a phone call with a friend last night, I think I may be coming through it. I stayed up past 9 p.m. and I exercised while watching hockey (love my mini-stepper). I'm actually looking forward to a night out or two this week. Bring it on, Winter. I'll survive your cold winds and short days and look forward to better days! Do you get the winter blues? How do you snap yourself out of them? This is what I saw after I dragged my garbage can into the garage on Monday night. It made me realize what the knocking sound was that I heard while driving home from the gas station a few minutes earlier. I just shook my head, put the gas cap back on and closed the door. I was officially one of those people. The people I have always silently judged as I passed them on the highway with their gas cap flapping in the wind. "How can you forget to put the cap back on?" "How do they not notice what is obvious to everyone they pass?" "Can't they see the open door in their side mirror?!?" The next time I pass one of these misunderstood humans, I'll just say a little prayer that whatever was on their mind while pumping gas works itself out and they have a better day. 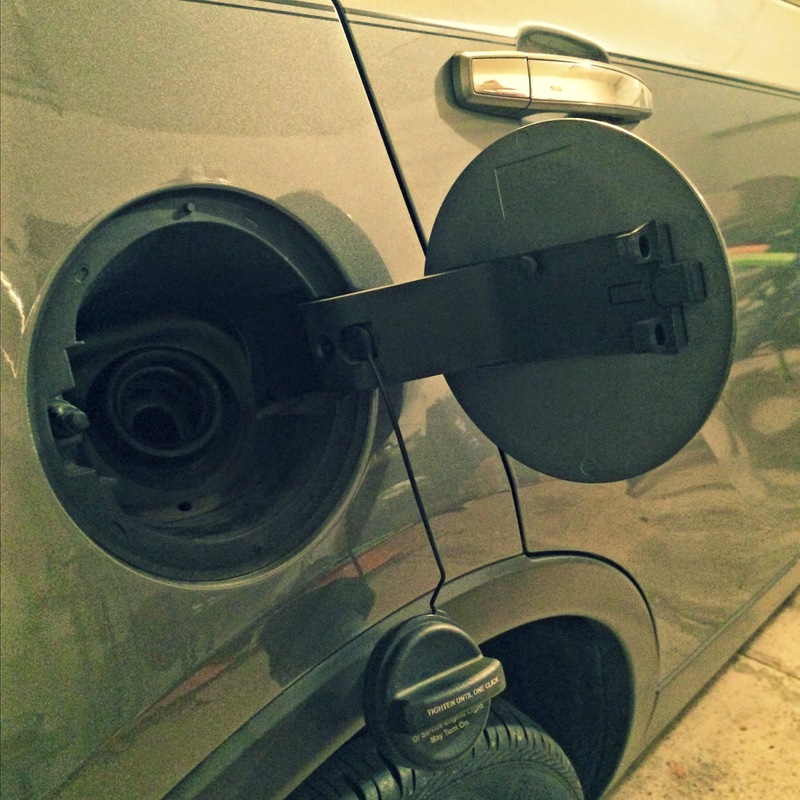 The next time I pump gas, I'll check twice to see if my gas cap is secured and the door is closed. The photo above was taken almost two years ago exactly from today. Here is the original post. 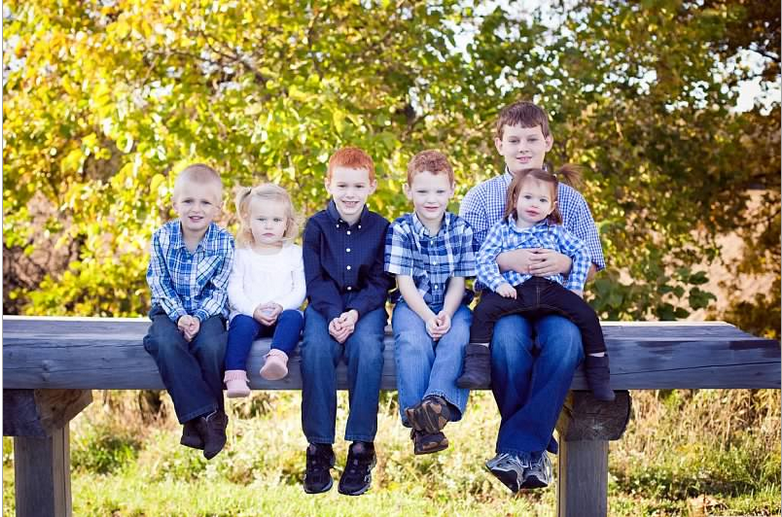 These are my beautiful, sweet and young nieces and nephews. Oh, how I love them. 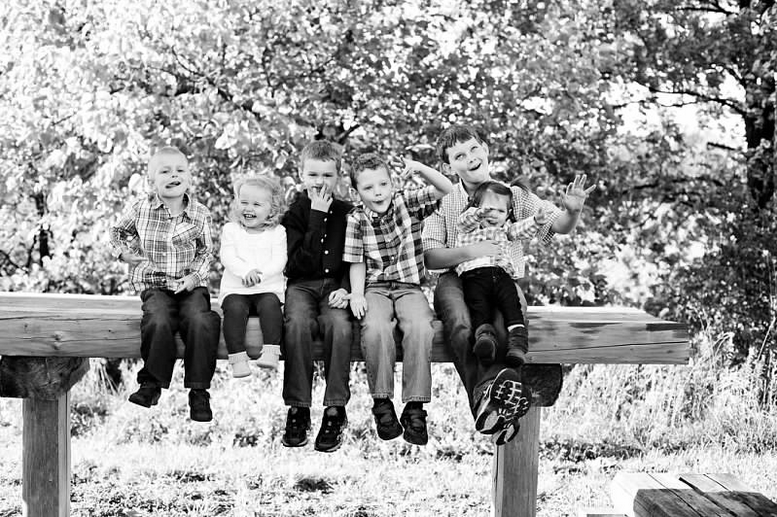 The above photo was taken by a professional and she did a wonderful job capturing our family. A couple of weeks ago, we hosted an event at our family farm and my dad's cabin was decorated for fall so my mom wanted me (a non-professional) to take some new family photos. I agreed to take new ones of them and their grandchildren. I told her that my sisters and I hadn't changed that much so we didn't need to be in the photos. At least that was my excuse...I really just didn't want to take a shower and get dressed up after a long weekend! 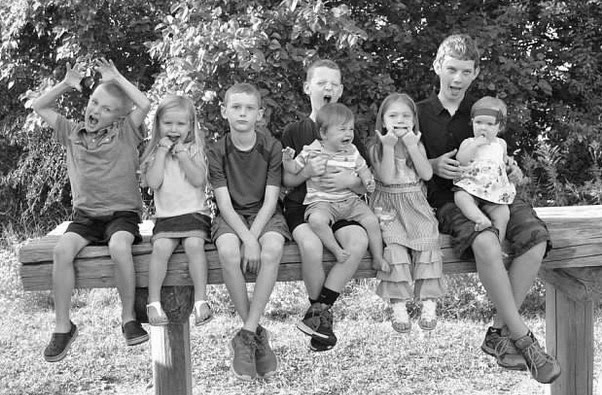 So, we decided to re-create a couple photos of the kids since we added two new kiddos and the original 6 decided to grow up. It's not quite as good as the original but I love how it captures the changes two years has brought. Did you notice that the original 6 are in the same order? Well, except that A is now sitting next to the eldest nephew and not in his lap, but close enough. 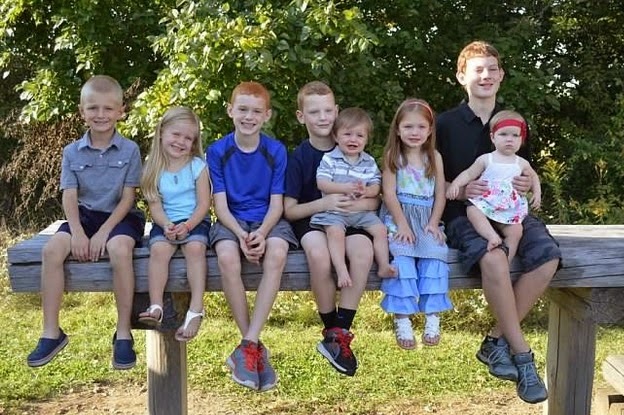 Now, those are my nieces and nephews! Love, love, love them! Sunflowers are such happy flowers, don't you agree? My sister has a row of them growing in her garden along one of my dad's soybean fields. 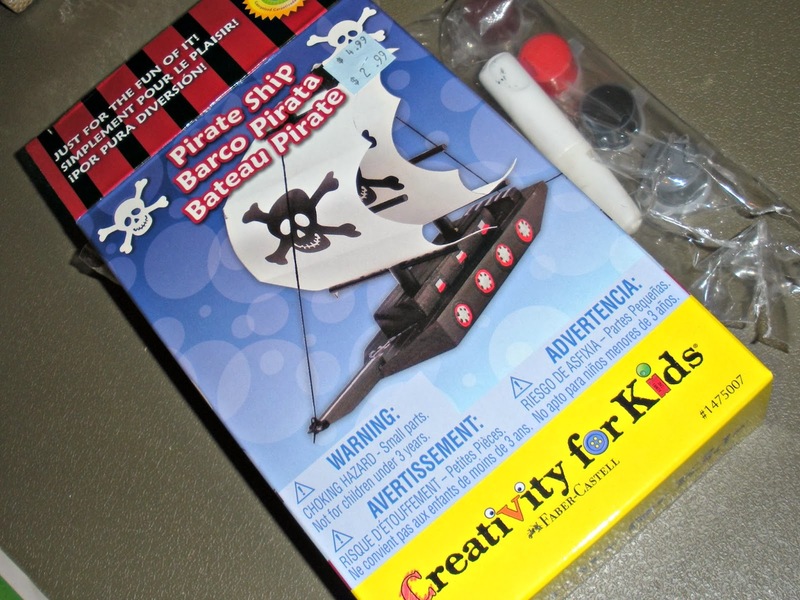 I took a few shots of them last week and decided to do a Wordless Wednesday post (does anyone still do these?) with them. A little flower among the flowers. 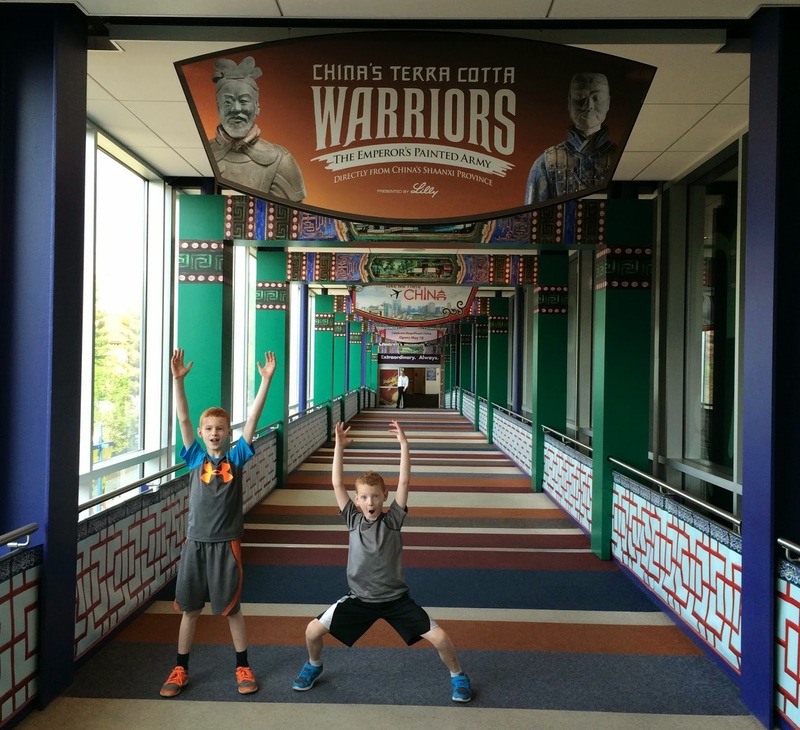 I had a couple of MUST DOs around Indianapolis this summer and one of them was to go to see the Terra Cotta Warriors exhibit at The Children's Museum of Indianapolis. So I took a day off of work, convinced my sister to use her family pass to take her boys, our three nephews and, of course, me. And it was awesome. My sister and I enjoyed it. Our 12-year-old nephew liked it. And my other nephews - aged 5, 6 & 9 - liked it. The baby seemed to enjoy it too, but who knows with babies. 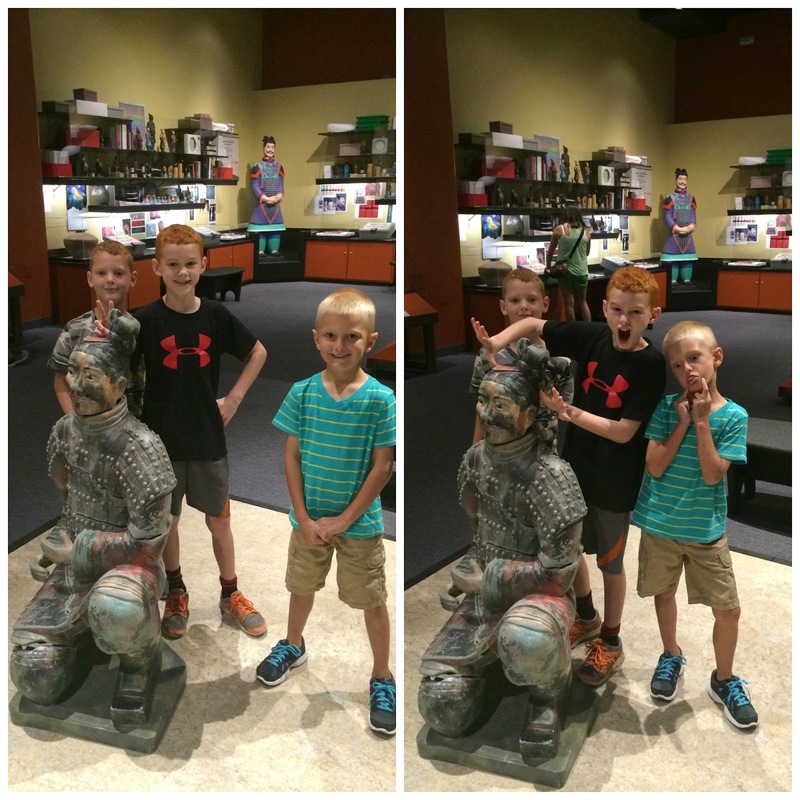 In addition to all of the history shared in the exhibit - including some of the actual warriors - it had enough hands-on exhibits to keep the boys interested. I could have done without the giant drum that they could play, but that's just me and my ears! They were able to put together the pieces of a warrior like the archaeologists had to do. They could put on armor and post next to a couple warriors. They could even put their face on one of the warriors and email a postcard to their mom. Here's a collage of the other 4 boys, including the baby. If I sent out Christmas cards, this would be it! 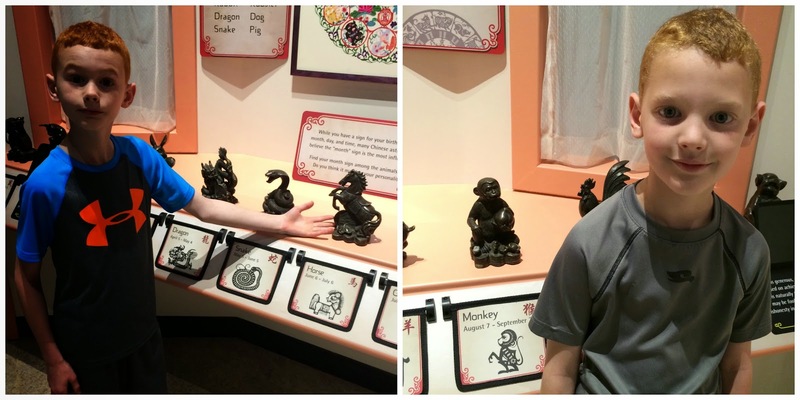 There is so much more in the exhibit that I didn't capture on camera, including making their own clay Terra Cotta Warriors! The exhibit is open until November 2, 2014 and this is the ONLY place to see it in the U.S. this year! The museum is really embracing China with a new Take Me There: China exhibit (see my post about it here) and the Great Wall of China Slide in the foyer (the slide usually only makes an appearance during the winter holidays). 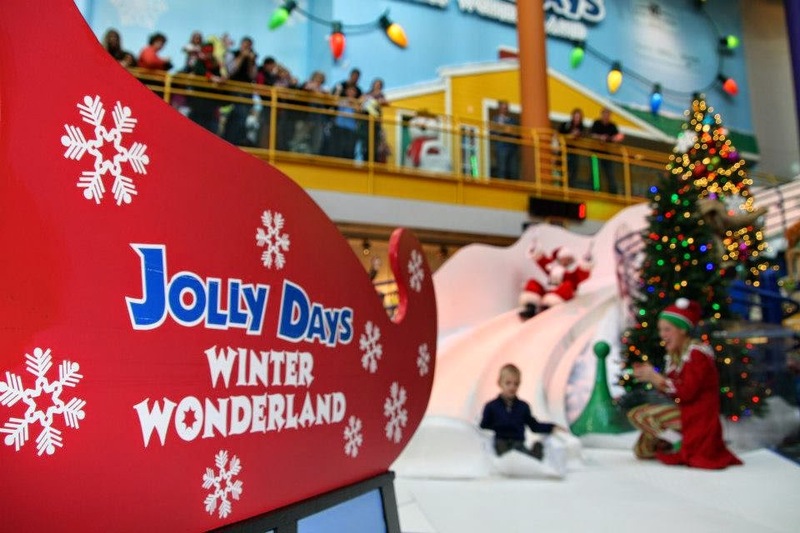 So, if you have a day in Indianapolis, I definitely recommend checking it out. 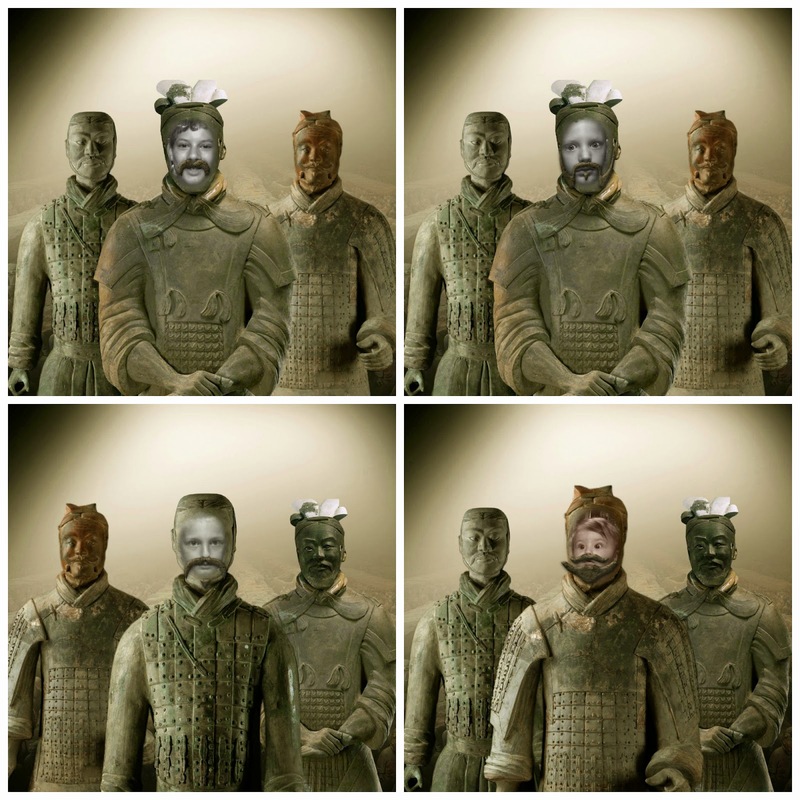 There is an additional charge and timed tickets are required to see the Terra Cotta Warriors exhibit. Find out more here. I'm definitely going back with a couple of friends - sans kids - so I can explore the exhibits a bit more AND get my own photo as a Warrior! One that talks about everything I'm going to do today. What I'm going to accomplish. How productive I'm going to be. I have to admit. I listen to the latter more than I should. Especially when it comes to things I don't want to do. Don't get me wrong. I think it's OK to listen to the "slacker" voice in my head sometimes but it's becoming a habit. I'm trying to break the habit and I think I cleared a hurdle this morning. Instead of staying in bed to read or play on my phone, I got out of bed and ran! This morning felt like a turning point. Like if I stayed in bed, I'd let the last 3 weeks of work go to waste. Like I'd go back to my old sedentary ways and never go back to the routine I am trying to make a habit. Let me tell you...it felt GOOD! Now, if I would only listen more closely to the overachiever voice in my head when it comes to cleaning my house. 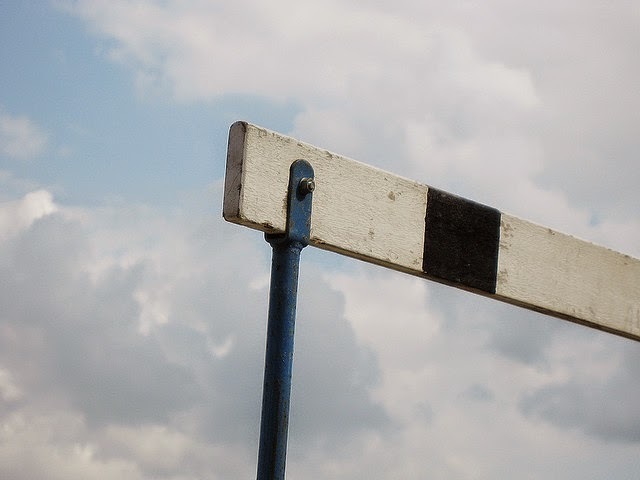 Oh well, one hurdle at a time, right? I was checking my email yesterday and came across a comment on my blog from an "Anonymous" fan. You know the ones I am talking about...the spammers. How did I know this one was spam? First, it said "Anonymous" as the name. Second, it filtered into my SPAM folder . Third, the comment read "This type of paragraph writing is exciting." "Paragraph writing." That's hilarious. Obviously it was SPAM, have you ever seen a paragraph on this blog! Now, if the comment said, "your use of the ellipsis is awe-inspiring" or "the way you use lists is mind-blowing," then I might take it more seriously! However, I did notice that the comment was on an old blog post about the random items found in the middle of my kitchen floor after three weeks of travel. That made me think about what was in the middle of my kitchen currently. That's not bad you say...a box of beer and the spoils from an Ikea shopping trip. Well, I went to Ikea 10 days ago. The beer and Capri Suns have been sitting there for a week before that. And the only reason they still aren't sitting there is that I ran out of cold beer in the fridge! This revelation has inspired me to start a new series here on the blog called "Things Found in the Middle of My Kitchen Floor (Really)." It won't be a regularly scheduled post but it will appear every now and then when I walk in the house and realize that I once again have a pile of random stuff in the middle of the floor. 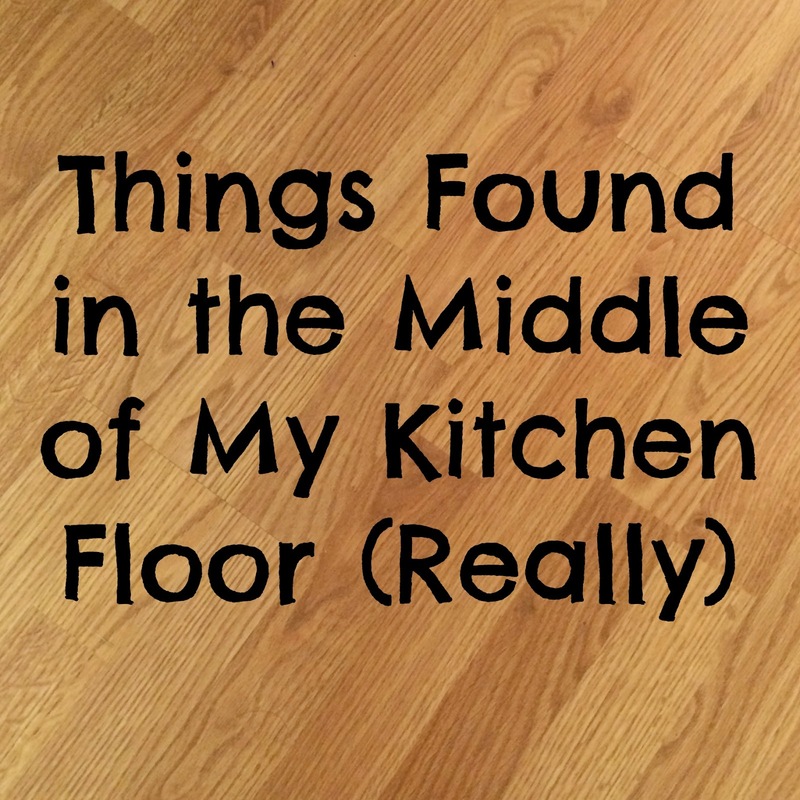 Feel free to share what's in the middle of your kitchen floor in my comments OR post a photo on my Facebook page with the hashtag - #KitchenFloorPile. Who knows what will be next...#KitchenTablePile or #SpareRoomPile or #TVRoomChairPile. The possibilities are endless...though the next hashtag I might be using is #FutureEpisodeofHoarders. Just had to share a conversation I had with my 5-year-old nephew this weekend. Me: Where did your dad take you for dinner tonight? T: I don't remember the name...you know that place where you can get Curly Fries? Me: Arby's, did you eat at Arby's? T: NO! Not Arby's! It's the one between the car place and the place where you can get Curly Fries. Got to love the way that kid gives directions...though I'm a bit scared that I followed along with the logic of a 5-year-old. This year my family is celebrating Easter today (on Holy Saturday) because of church schedules and in-law celebrations tomorrow. This means we get to combine our Easter day traditions in with our annual Butterscotch Rolls that we eat on the Saturday evening before Easter. I've blogged about this tradition before. I have no idea how it started but it is one we've continued even after my grandma passed away several years ago. Punching down the dough so it can rise again. 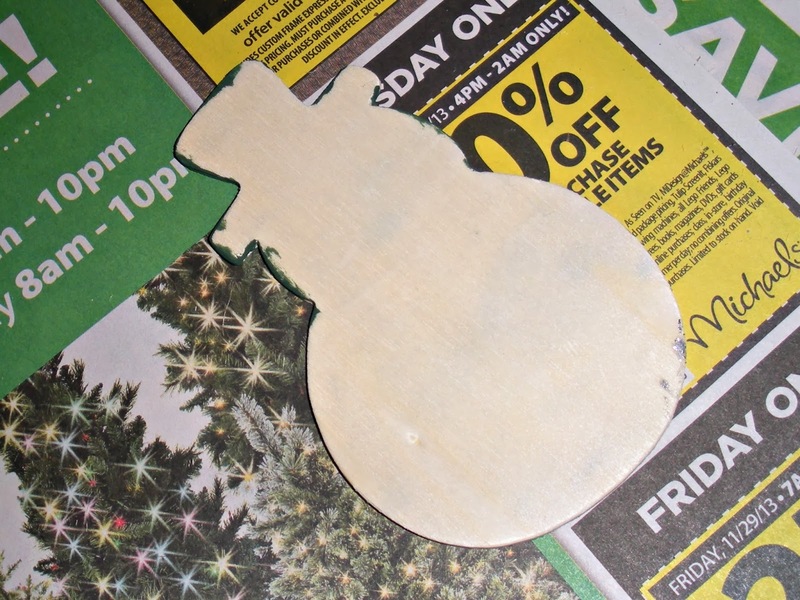 My niece really enjoyed helping with this part! Any foods you MUST make for your Easter dinner? Have I mentioned on here before that I may have a slight attachment to my morning coffee drink from a well-known coffee franchise? I may or may not use the promise of said cup of coffee to motivate myself to get out of bed, get ready and drive to work some days. Well, sometimes it's more often than that and here's where the title of this post comes into play. In the last three months, a beautiful, kind soul has bought my coffee for me in the drive-thru before work on multiple occasions. I don't know who she is (in my mind, it's the same woman every time but I really don't know). My first reaction is usually "oh my, did she know she was buying a $5 cup of coffee for a stranger (yes, I said $5 for a cup of coffee...it's my vice...get off my back). My second reaction is "what a sweet, lovely gesture." My third reaction is "I need to continue to pay forward the kindness." So, here's my question to you, my friends...If this has happened or would happen to you, do you pay for the next person's drink that day to keep "paying it forward"? I always wait until the next time I'm go through the drive-thru and pay for someone's drink then. Is there a correct way to do this? Do I look ungrateful when I just take my free drink and drive away? I have read organizational blogs. I have downloaded e-books to give me daily assignments on what to organize. I have heard lectures from my mother on if "I just do one thing a day..."
But I still can't seem to get motivated to stay organized and keep my house clean. I do agree with others that everyone is different and what works for one person may not work for another. I also agree with my friend Leah that some people are just BORN with the "cleaning gene" and it SKIPPED right over me. So, I decided to share three things that have helped me stay on track when trying to clean up after myself. I admit to my mother and the other four people who read this blog that these 3 tips haven't miraculously made my house immaculate, but they are helping me conquer the clutter. I'd love to hear what has worked for you - or not worked for you. 1. Make a list. But don't make it too long. And don't beat yourself up if you don't get them all done. Think of it as a suggestion list. If I think of it as a "To Do" list, then it feels too much like a chore. I think of it as a "Challenge" list. Can I get at least one of these done before I get distracted and end up eating M&Ms and watching Seinfeld re-runs. This fun little noteboard is on my fridge. I made the list above when I was home on a snow day recently. The good thing is that I completed two of the three items on the list completely. The bad thing is I now have two big boxes for Good Will sitting in the middle of my kitchen floor. 2. 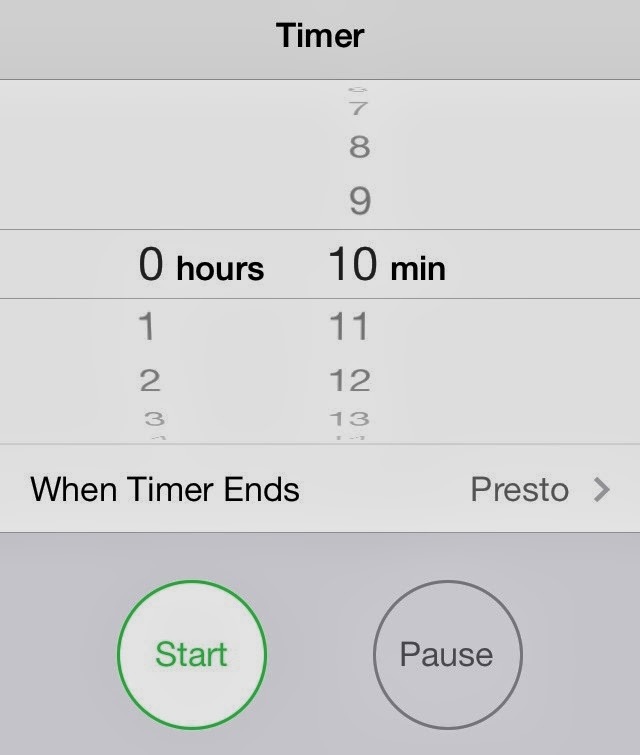 Set a timer. I find that if I give myself a 10 minute or 20 minute or even 30 minute timeframe to tackle a chore, I am more likely to stick with it and not have as many "squirrel" moments. You know what I'm talking about...when you start cleaning off your kitchen table and go to put away something in a closet and see something in the closet that needs to be put in the Good Will pile and then wait a minute is that shirt supposed to be in the Good Will pile and all of the sudden, it's 30 minutes later and you have totally taken apart the Good Will pile and your kitchen table is still a mess. 3. Tackle one room at a time. Have an hour between swim lessons and Bible study? Go into the kitchen and start the dishes. Then move onto sweeping the floor. Then take a quick look in the fridge and see what needs pitching. It will keep you focused and you will see immediate results. That's it. Those are the three things that have seemed to work best for me. Share your tips...please. Share what hasn't worked for you...pretty please. 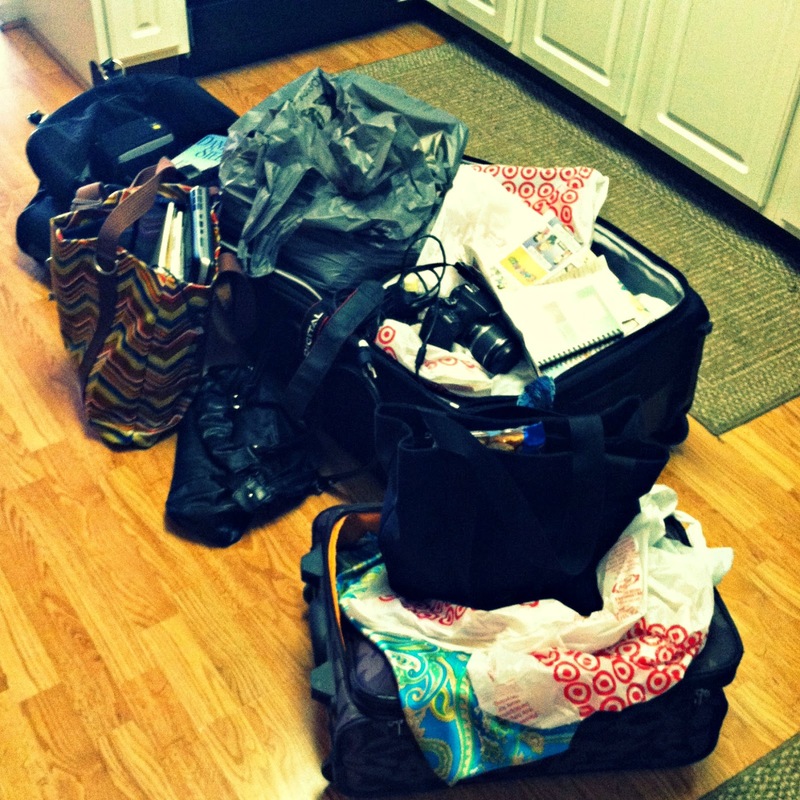 I know I'm not the only one out here who struggles with the clutter! BONUS TIP: Make yourself do X things. I can't believe I didn't remember this one when writing this post! It is one I use all the time. I have to put away 5 things before sitting down to watch TV at night. It can be as simple as picking up the newspapers and putting them in the recyling basket or as tedious as doing the dishes - each of those only count as one thing (not each dish as one thing). As you can notice, I have to give myself limits...yes, I know I sound like a child! Last night after a huge spinach salad (IMNSLO - in my non-salad loving opinion), I couldn't help remembering a picture I saw on Facebook earlier in the day. So after being a good girl and eating a salad for supper, I immediately went to the kitchen to see if I could make my own version of the warm, gooey treat. My supplies were a bit limited but I think my version turned out just fine! I used a ramekin instead of a cast iron skillet and peppermint mini marshmallows (an after-Christmas buy) in place large marshmallows. I cranked up the oven to 450 degrees and while it was heating up, I put a layer of dark chocolate chips (use your favorite - milk, semi-sweet, white) on the bottom and topped it with a layer of mini marshmallows. When the oven was pre-heated, I popped the ramekin in for about 8 minutes (until the tops of the marshmallows started to brown). Don't let it cool too long before digging in! I ate mine with pretzels but it would be great with graham crackers or with a spoon! This was perfect for one person but probably plenty for two! I have aspirations of being a blogger. One who writes posts that are useful, entertaining and/or inspiring. Instead I'm a blogger who goes months without posting. One who plans posts in her head and then never writes them down. Blow up decorations in a cactus garden...really? Well, it's a new year and with it comes renewed motivation to get back on the horse (well, back to the keyboard...I don't ride horses) when it comes to blogging. I shared some ideas about teaching children (and yourself) how to save money in fun ways over at Real Farmwives of America. 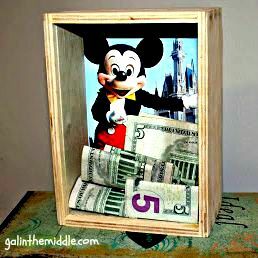 The post inspired me to kick start my savings for an upcoming trip to Disney World with my sisters and nieces. 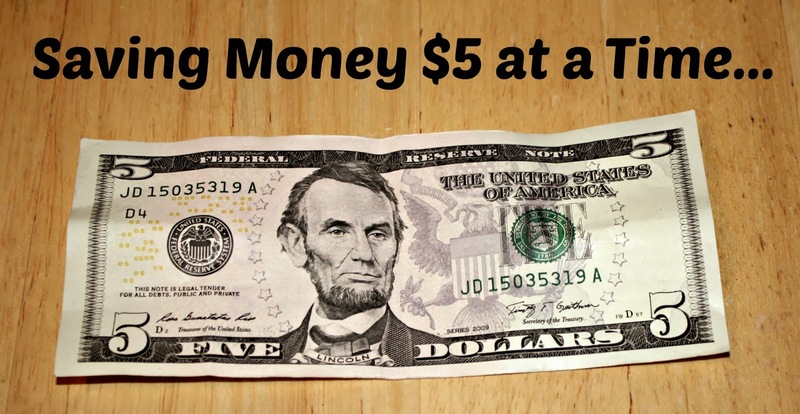 A friend of mine helped fund two recent trips by simply NEVER spending a five dollar bill for almost two years. Wow, could it be that simple? I'm looking forward to the challenge of tucking away these bills over the next year and seeing where I end up. I am sure I won't have enough to bankroll the Disney trip, but I'm hoping I have enough to pay for some meals while there. Of course, I may have to go Dave Ramsey style and start using cash for everything. 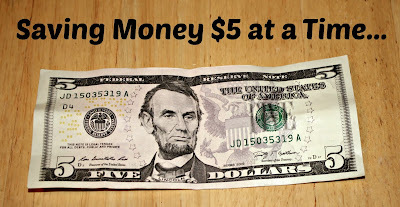 It's kind of hard to save $5 bills when you use a credit card all the time!